This is a question that I am often asked. Most dogs and cats absolutely love the taste and will lick the bowl for every last crumb. Others can be a bit fussy and you need to get a bit inventive if you want them to get the whole amount. It is important that they do eat the whole amount. With some of these ingredients, a half dose won’t help at all. So be sure to check the bowl afterwards and also check that they haven’t spat it out around the corner. 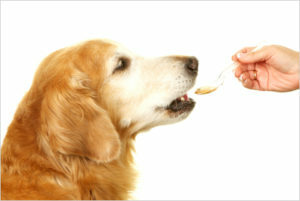 If you are feeding kibble, try adding a small amount of water or milk to the food, to make the powder stick. Or add a spoon or two of wet pet food to the kibble. If you’d prefer to give the product separately to the meal (and yes, this is also okay), mix it in a small amount of peanut butter and most pets will lick it off the spoon. Other things which our customers have suggested mixing with the supplement: beef stock, Canola oil, meat, cheese, egg etc. Please let me know what has worked for you! I’ve always mixed joint formula and their other supplements into something wet. If I’m feeding them kibble then they get a separate bowl of pilchards/mince/raw chicken/cooked liver. I do that so their kibble doesn’t get soggy in case they don’t eat it all in one go. If I’m feeding raw (as I’m trying to do now for the second time and hopefully this time they’ll stick with it) then it gets mixed into that.